By signing up with Projects Abroad you are donating your time and skills to work directly with communities in need through a structured project. However, even volunteering comes at a cost, especially if you want to support long-term, meaningful projects where they’re needed most. This is why we charge a fee for volunteering or interning abroad. While it may be cheaper to go at it alone on your own volunteer trip, there are many benefits of volunteering through an organization like ours. It is difficult and time consuming to find projects to support in a foreign country that are safe, worthwhile, and reputable. When you sign-up with Projects Abroad, you will receive travel and visa support, orientation, a safe place to live while in your destination, a supportive work environment, a safety net through our local and professional full-time staff and logistical support, in addition to clear expectations of the work you will do from day one. In short, you are paying for an option you can trust, an option that will ensure that your trip is worthwhile and an option that will make a positive and sustainable impact on the community you have chosen to serve. Use our Fundraising Guide to help you raise money to for your project through Projects Abroad. We are an independent organization that does not rely on fundraising or government funding to achieve social goals. We get all our funding from the fees paid by our volunteers and interns. These fees are not a once-off donation to your chosen project. These fees go towards the costs of your trip, long-term support for the project you work on, and the international organization and infrastructure needed to make sure our projects and social goals around the world are sustainable and successful. And, of course, we don’t request money from our partner organizations in the developing world. All our work is 100% funded through your contributions as a volunteer. It is this financial independence that gives us the freedom to set up projects wherever we consider these will have the most impact and where we believe that our volunteers can make a valuable contribution. We want to be as open as possible about how your volunteer fees are spent, but it isn’t possible to give exact details of how each volunteer’s contributions are distributed. However, we have set out the average percentages and some clear explanations. 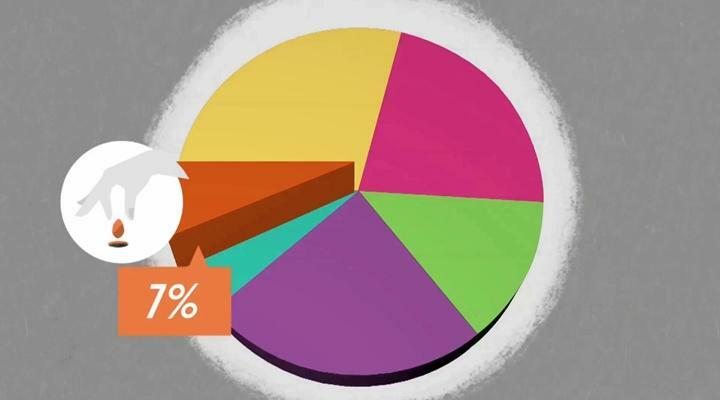 These percentages represent the average of all our projects, and are based on our 2014 figures. Depending on the country of origin, the destination, the time of year, the type of project and other factors, these figures will vary from project to project. Although you are volunteering your time, there are costs associated with your experience in a country that need to be covered. These daily costs include meals, accommodation, transport between your accommodation and placement, airport transfers, and insurance premiums. Volunteer fees also help fund project activities and pay for much needed resources, from school supplies to construction materials. Other indirect costs include local office rent, utilities, equipment, and communication infrastructure. We also must pay government registration costs and provide for bookkeeping and tax reporting. Running a business that spans 50+ countries takes a lot of organization. This requires us to invest in human resources, administration, financial controls, and IT. All of these require skilled and trained staff (and the salaries and benefits for each of them), as well as infrastructure and offices for these staff to do their work. One large problem for many of our partners in destination countries is that they can’t afford to promote their work and reach potential volunteers and interns. 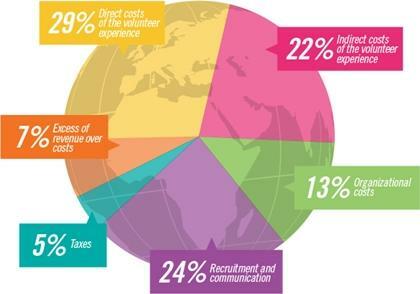 We tell the world about volunteering and interning and it can’t be done without incurring costs. Each recruitment and communication office has related rent, utilities, equipment, and communication costs, not to mention the salaries, benefits, and training of our recruitment and communication staff. Each of these offices also has government registration costs, bookkeeping, and tax reporting costs. We believe that recruitment and communication are important long-term investments in the size of our organization and in sustaining the many projects we run around the world. Effective recruitment and communication allows us to attract more participants, which in turn allows us to aim for larger social goals and to bring down program fees by achieving economies of scale. As a well-run organization, we do build up revenue over and above the costs of running the business. This allows us to fund our growth and expansion by providing capital to set up new projects and new destinations, and completely fund some projects, even if these run at a loss. Building up a reserve of funds also means that we are able to act swiftly in a time of emergency, as we did with disaster relief efforts in the Philippines in 2013 and in Nepal in 2015. It gives our staff, volunteers, and interns significantly added security, as the organization can keep operating and supporting projects during times when there are low numbers of volunteers. Your fees make a positive difference to the lives of thousands of people around the world, long after you go home. It directly funds the project you volunteer on, and has a ripple effect in the local community, the country you volunteer in, and across the globe. Many people in the developing world benefit from your contribution. Without you and the thousands of volunteers that have come before you, none of this would be possible.